Central Park offers Santa Clarita residents a chance to flex their “green” thumb. On October 28th, the Santa Clarita city council held a ribbon cutting ceremony which celebrated the expansion of a community garden in the community of Saugus in Santa Santa Clarita Community GardenClarita. 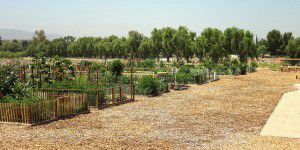 Located at Central Park off of Bouquet Canyon Road, the community garden offers 80 garden sites with plot sizes of either 10′ x 10′, or 10′ x 20′. Gardeners who wish to explore their “green” side have a chance to grow fresh, pesticide-free vegetables by employing organic gardening practices. Since its initial launch in 2011, the Santa Clarita Community Garden has been a hit with locals. The recent expansion added 51 new garden plots to the area, which officials hope will reduce the wait list that is currently in place for eager gardeners. Mayor Bob Kellar compares the community garden to a “sanctuary where residents enjoy planting and tending to their own fruits and vegetables.” The opportunity to not only grow your own organic vegetables, but to network with other gardeners are only a few great reasons to participate. Homeowners and apartment dwellers alike come to share their knowledge and to be able to enjoy the outdoors in a warm and inviting atmosphere. Due to its popularity, even with the increased number of plots recently unveiled, there is still a waiting list for plots at the Santa Clarita Community Gardens. The best approach is to access their website, and go to the About section to learn more. Gardeners are charged a nominal annual rental fee, and there are rules and guidelines that must be met to continue participation at the gardens, which are open from sunrise to sunset.